Business Overview – Mitsib Leasing PCL. 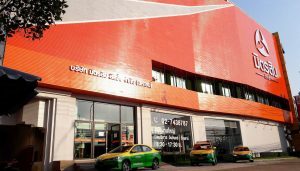 Mitsib Leasing Public Co., Ltd. is a brand new and used taxis dealership, including loan and leasing services exclusively for taxis and public transport, with strong business insight and unique operational strategy. We focus on providing fair and straightforward services to taxis clients, and have developed close relationship, which help us design suitable plan that appropriate for their goals and financial conditions. We are now ready to expand the service expertise to public transport service provider clients. Let us be a part of your success story. Launched Mit Sib 10 Leasing Co., Ltd.
Extended service line approach focus on selling full license refurbished taxi, in condition that correspond to public transport regulation, with leasing service. Commenced taxi dealership and a board leasing service provider. Introduced refinance programme for clients with outstanding payment records. • Increased service channels in response to larger demands, the company launched a new service outlet in Suk Sawas area. • Mitsib Leasing Public Co., Ltd. has changed the legal status from Company Limited to Public Company, to follow SET pronouncement of listed company. Now, Mitsib Leasing Public Co., Ltd. has the full potentiality to advance the management and service. Committed to developing taxi businesses in Thailand and becoming a leading credit provider with all-inclusive services, while promoting and supporting taxi drivers to achieve a higher quality of life with stability and sustainability. We are the leading taxi distributor that provides credit services for taxis and commercial automobiles in the form of “one stop service". Regulate business with good governance framework. Carry out the top form. With our awareness of client's needs and conditions, we intend to deliver our services with consideration and fairness, likewise our products.